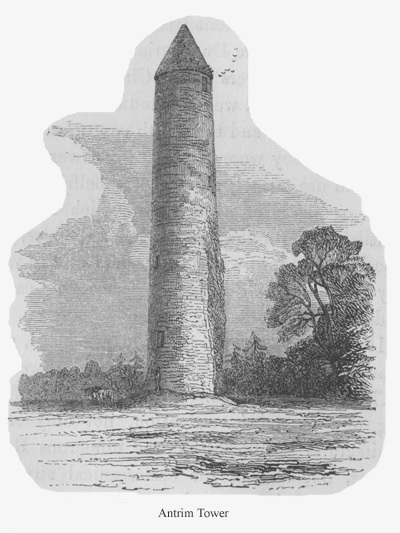 OUND Towers, of about eighteen feet in external diameter, and varying in height between 60 and 115 feet, are frequently found in connexion with the earlier monastic establishments of Ireland. The question of their origin and uses has long occupied much antiquarian attention. In the seventeenth and eighteenth centuries they had been regarded by our antiquaries as the work of the Danes; but towards the close of the last century General Vallancey propounded various theories, which assumed them to be of Phoenician or Indo-Scythic origin, and to have contained the sacred fire from whence all the fires in the kingdom were annually rekindled. I. That the towers are of Christian and ecclesiastical origin, and were erected at various periods between the fifth and thirteenth centuries. II. That they were designed to answer, at least, a twofold use, namely: to serve as belfries, and as keeps, or places of strength, in which the sacred utensils, books, relics, and other valuables, were deposited, and into which the ecclesiastics to whom they belonged could retire for security, in cases of sudden attack. III. That they were probably also used, when occasion required, as beacons and watch-towers. DOORWAYS.—In form similar to those which we have described as characteristic of the early churches, but they are generally more highly ornamented, and appear to have been furnished with double doors. They are placed almost invariably at a considerable elevation above the ground. A flat projecting band, with a small bead moulding at the angles, is the most usual decoration, but in some instances a human head, sculptured in bold relief, is found upon each side of the arch. 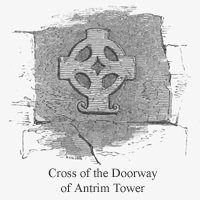 A stone immediately above the doorway of Antrim tower exhibits a cross sculptured in alto-relievo; and at Donoughmore, in the county of Meath, a figure of the Crucifixion occupies a similar position. This style of decoration may have been much more common than is generally supposed, as of the number of towers remaining in Ireland the doorways of at least one-third have been destroyed. Concentric arches, with chevron and other mouldings, occur at Timahoe and at Kildare. WINDOWS AND APERTURES.—Generally similar in form to those in contemporaneous churches, with this difference, that they never splay, and that the arch-head in numerous examples is of a different form upon the interior from the exterior. The tower was usually divided into stories, the floors of which were supported by projections of the masonry, or by brackets. Each story, except the highest, was generally lighted by one small window: the highest has generally four of large size. A conical roof of stone completed the building. In the village of Clondalkin, at a distance of about four miles from Dublin, and adjoining the station of the Dublin and Cashel Railway, stands one of the most perfectly preserved of the Round Towers. Its height is about eighty-four feet. The doorway, which is approached by a flight of stone steps, comparatively modern, is square-headed, and perfectly plain, as are also the windows and other apertures. Some years ago a gentleman of the neighbourhood caused this tower to be repaired, upon which occasion floors were added, and placed in their ancient position. Access may be had from story to story by the aid of fixed ladders, so that a visitor has here an opportunity for observation not frequently to be met with. It should be observed that the projection at the base is not found in any other instance, and that it may possibly be an after-work. The tower of Clondalkin, though nearly perfect, cannot be considered a very fine example of its class. It is unusually low, and its roof, which does not appear to be original, is wanting in that degree of lightness and elegance observable in many. The other towers in the immediate neighbourhood of Dublin are at Swords, Lusk, and Rathmichael. 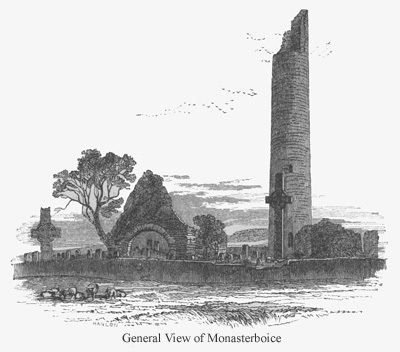 The last is a mere stump, and as the others do not present any point of attraction not equally to be found at Clondalkin, we shall refer our readers to the noble example at Monasterboice, within four miles and a half of Drogheda. 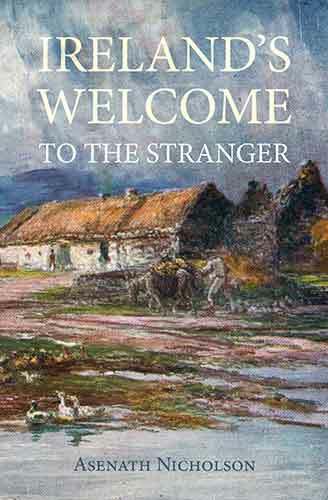 The churches, the tower, and the magnificent crosses of this ancient seat of piety and learning, form a group of ecclesiastical antiquities in many respects unsurpassed in Ireland. A description of the crosses will be found in a former chapter. The tower, the erection of which there is every reason to refer to a very early period, is one of peculiar and striking interest, exhibiting, as it does, a decorated doorway, the head of which is cut out of two stones laid horizontally one above the other. A band extends round the head and down the sides of the doorway, but terminates on a level with the sill, or rather turns off at a light angle, passing horizontally for a distance of eight inches, from which point it ascends, and, running upwards round the doorway head, gives the appearance of a double band. 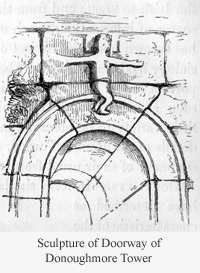 A space between the bands, upon each side of the upper part of the doorway, and one upon the semicircular arched head, left uncut, appear suggestive of the cross. 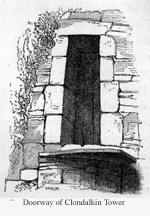 The window immediately over the doorway may be looked upon as a characteristic example of the opening found in a similar position in most of the towers, and which is supposed to have answered the purpose of a second doorway, or to have been designed for the purpose of affording persons within the tower some means of defending the doorway beneath. In this example, however, it is unusually small. The other windows are square-headed, as were also the large apertures of the uppermost story [see Wright's Louthiana, plate 14, Book iii.] The masonry is good, and characteristic of a very early period; the stones large, well fitted together, and passing through a considerable thickness of the wall, as may be observed in the upper portion of the structure, where, from the effects of lightning, or from some other cause, a considerable rent has been made. A church of very rude construction, and probably several centuries older than the tower, stands in the cemetery, at a little distance to the north-east of the other remains. Its only doorway is placed, as usual, in the centre of the west gable. It is square-headed, and possesses every indication of a very high antiquity, but the accumulation of the churchyard soil has buried the lower portion at least to a depth of several feet. The church presented anciently the nave and chancel; the latter has been destroyed, but a plain semicircular chancel arch remains. The church immediately adjoining the Round Tower is obviously an erection of the early part of the thirteenth century. For a notice of the crosses of this most interesting locality see chapter iv., page 87. Since the opening of the Dublin and Cashel Railway, the ancient town of Kildare is brought within a journey of scarcely two hours of the metropolis, and, by taking an early train from Dublin, the student of antiquities may examine the ruins of Kildare, Carlow, and Killeshin, and return the same day. The Round Tower of Kildare is in several respects one of the most remarkable in Ireland. Its doorway, of which we annex an illustration, is unusually rich, consisting of three concentric arches, upon two of which a variety of mouldings appear. The external arch is quite plain, and evidently not so ancient as the others. A rudely constructed canopy, a portion of which still remains, anciently surmounted the doorway. This tower, it should be observed, is unusually large, and bears evidence of having been repaired at various periods. Like the Round Tower of Cloyne, in the county of Cork, it is finished with a plain battlemented parapet, comparatively modern, and added, probably, at some period when the original roof of stone had lately been destroyed by lightning or by other means. In a preceding chapter we noticed the singularly interesting group of early ecclesiastical structures remaining in the valley of Glendalough, in the county of Wicklow. 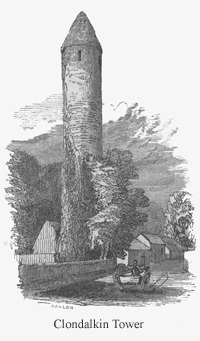 The Round Tower, a work apparently coeval with the "Cathedral," may be looked upon as one of the most ancient now to be found in Leinster; and as, with the exception of the roof, it retains all its original features, and appears never to have been repaired, there are few structures of the kind more worthy of an attentive examination. Such of our readers as may be induced to visit the antiquities of Dowth and Newgrange, are recommended to extend their drive as far as Donoughmore, near Navan, where they will find a tower interesting in many points, but particularly as the stone which forms the crown of its doorway arch, and the one immediately above it, are sculptured with a figure of the Crucifixion, as represented in page 102. * Thomas Davis, in the Nation.